When it comes to diversity, access and inclusion — both at the undergraduate and graduate level — The Ohio State University (OSU) has consistently been leading the way. With 66,444 students and a $4.2 billion endowment, the 148-year-old institution has been intentional about creating initiatives both in the academic and student affair space that cater to minority and first-generation college students. “The Ohio State University has a rich and long-standing history of recruiting, retaining and graduating students of color,” says Dr. James L. Moore III, vice provost for diversity and inclusion, chief diversity officer, executive director for the Todd Anthony Bell National Resource Center on the African-American Male and the EHE Distinguished Professor of Urban Education at OSU. A leading expert on the issues that impact African-American males, Moore says that OSU’s Office of Diversity and Inclusion — formerly the Office of Minority Affairs — was founded in 1970 and is now one of the nation’s oldest and most comprehensive offices in the country. 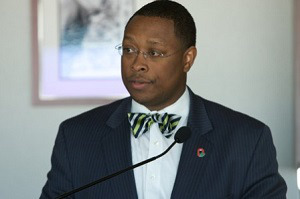 As vice provost for diversity and inclusion and chief diversity officer — a post he was appointed to earlier this year, after first serving as interim — Moore says that he is charged with working to reengage with alumni of color as well as corporate and philanthropic partners to help raise the necessary funds to advance inclusive excellence. It is however, OSU’s impressive record regarding the recruitment and retention of Black males that has distinguished the university from some of its peers. The Todd Anthony Bell National Resource Center on the African-American Male is one of the few centers of its kind that is housed at a major research university. Regarded as one of the nation’s preeminent educational and research centers, it has been lauded internationally for its work in examining and addressing critical social issues that impact the quality of life for Black males. Over the years, more than 50 colleges and universities across the nation have conducted visits to campus with the goal of replicating OSU’s success. This past year, Moore says, there were a total of 577 Black male undergraduate students with a 3.0 cumulative GPA, out of a total of 1,200 Black males. That’s an impressive record, considering that many institutions note that too many of their Black male students continue to struggle in college and run the risk of dropping out. Moore says that, since the Bell Center was founded in 2005, much has been accomplished in this arena, “but we still have a lot more to achieve,” he adds. With Dr. Michael Drake — an African-American as president of OSU — Moore says that the commitment to diversity and inclusion, which has been embedded in the mission of the university, will remain an important priority as students, staff and faculty return to campus this month for the start of the 2018-2019 academic school year and beyond.